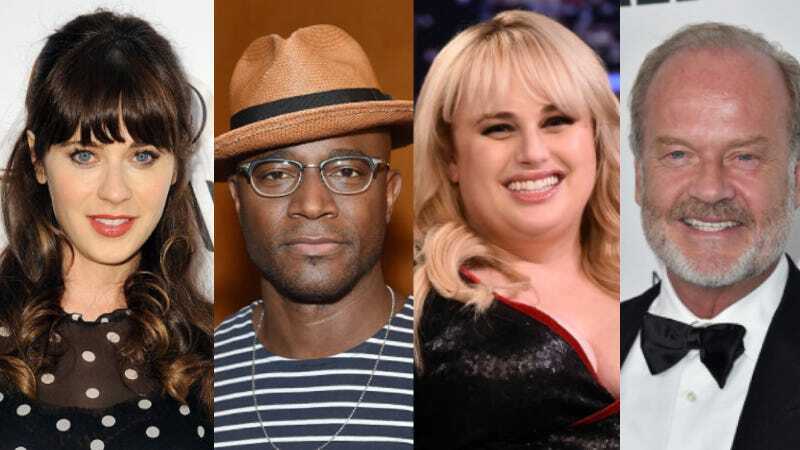 In May, Disney will be producing Beauty and the Beast Live in Concert at the Hollywood Bowl, and they are really stacking this cast with some surprises. Entertainment Weekly reports everyone seems to want to live in a Disney fantasy; or they at least want to visit with two nights of live performance. Zooey Deschanel has been cast as Belle and Taye Diggs will play her macho/unwelcome suitor, Gaston. Jane Krakowski is an age-inappropriate Mrs. Potts, and I’m hoping for Jenna Maroney levels of musical scene-stealing for every number. Then we have Kelsey Grammer stepping in as horny candle Lumiere, plus Rebel Wilson as LeFou. Rebel Wilson as LeFou? Rebel Wilson as LeFou. Okay. That’s LeFine. The Beast is played by Anthony Evans, an alum of The Voice who I have never heard of. I assume he has some pipes to supplement the sheer star power of the rest of the cast. In 2016, Disney similarly mixed up live performances with digital projections and dance numbers to approximate The Little Mermaid on stage. It must have been pretty fun, because now all of Hollywood wants to do it. The timeless appeal of bestial love wins again.